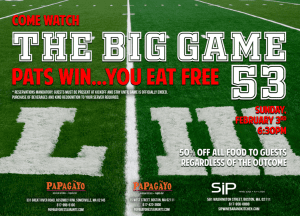 Cheer for the Patriots on Sunday at Papagayo and if the Pats win… you eat free! If the Patriots do not win, the meal will be half-off so you will still win a little. For more information or to make a reservation, please head here. Will you be at Papagayo on Sunday? Have you done this promotion before? Free Cheesecake Slices from The Cheesecake Factory Delievered on Wednesday! The Cheesecake Factory is celebrating 40 Years with 40,000 FREE Slices of Cheesecake on Wednesday, December 5, 2018– right to your door! Starting at 11:30 AM, head over to DoorDash and select a slice of cheesecake (up to $8.95 value) and enter promo code FREESLICE through DoorDash. There are no delivery fees and no minimum order requirement, but you may want to tip your DoorDash driver. If you do miss this deal or would rather order real food, The Cheesecake Factory is offering $0 delivery on all CCF orders through DoorDash starting Wednesday morning to December 11, 2018– no promo code needed! Also, if you are new to DoorDash, you can sign up through a friend’s referral link for a free $5 credit + new customers get free delivery on orders for 30 days. For more information regarding free cheesecake slices from the CCF, please head here or head here for more information on DoorDash. Will you be eating cheesecake for lunch on Wednesday? 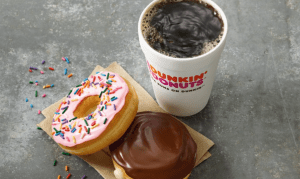 $1 Coffee at Dunkin’ for DD Perk Members Today! Dunkin’ is celebrating the Red Sox World Series win with $1 medium hot or iced coffee today, October 31, 2018! This $1 coffee offer is available to DD Perks members with an enrolled Dunkin’ card. Limit one per person. For more information or to sign up for DD perks, please head here. Mookie’s Stolen Base Brings Free Tacos! A base was stolen during Game 1 of the World Series which means free tacos from Taco Bell! Thanks Mookie! Head to Taco Bell on Thursday, November 1, 2018 from 2-6PM for FREE Doritos Locos Tacos! This promotion is nationwide and you can find the nearest Taco Bell location near you here. For all the terms of this promotion from Taco Bell, please head here. 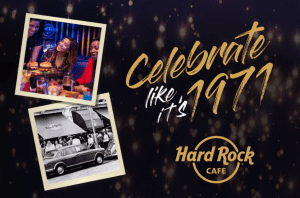 Hard Rock Cafe Celebrates Birthday with .71 Burgers! Celebrate 1971, the year Hard Rock Café first opened their doors in London, with .71 Legendary Burgers! Head into your local Hard Rock Café on Thursday, June 14, 2018 between 11AM and 12PM to enjoy a legendary burger for .71! For more information or to make a dining reservation for Thursday, please head here.